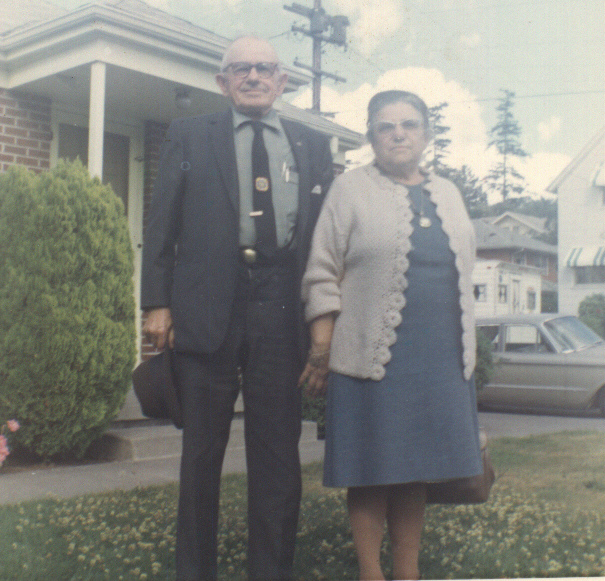 This week the Book of Me, Written by You prompt is about my grandparents. I’ll start by telling you about my Dad’s parents. I knew both my Grandma and my Grandpa on this side. My Grandfather was Jean Lassalle a native of Ogeu les bains, France, born in 1888. He arrived on American shores in 1907. He came to America to avoid conscription. He ended up in the military anyway as he was drafted for World War I. Luck was with him though. He was sent over to France as an interpreter but the war ended before he reached French shores. In his early years he worked in a French laundry, a winery (cleaning vats), and assorted other jobs. He eventually became a baker by trade. He also signed up for the National Guard to help the family survive the Depression. 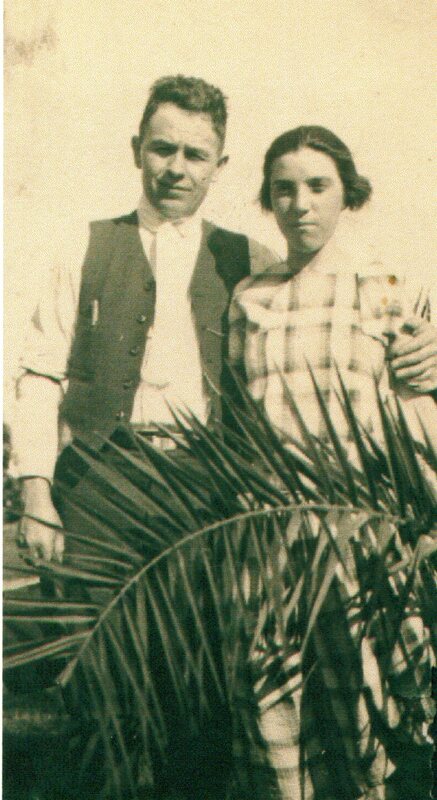 My Grandma was Anna Mazeres. She was born in San Francisco, CA in 1897. Both her parents were immigrants from France. Her father came from Ogeu les bains just like my Grandfather while her mother was from Castet, France (which is in the same region). Grandma worked in her family’s French laundries as a teen and then later when her mother was widowed and ran them alone. She was listed as a dressmaker in 1920. I’ve heard recently that she also worked as a nurse prior to marriage. I do not know how my grandparents met. It seems to be one of those simple details that slipped through the cracks. I suspect they met at one of the French community functions. There was a lively French community in the San Francisco Bay Area at the turn of the century. Or, perhaps it was through the French laundries. Both of them had connections to the business through their own work and through the laundries their families owned. They were not related at least not in any recent generation. Though, since both had their heritage in the same village in France, there is a good chance there is a cousin connection in the tree. I knew both my grandparents. My memories of Grandpa Lassalle are more vague as he died when I was 9. I remember him always wearing a bolo tie and sometimes he wore a beret. His English was terrible and I barely understood him. I was told to nod yes to whatever he said. He probably thought I was a very stupid child. He was a talented cook and made something that everyone knew as Grandpa’s Soup. No one can forget Grandpa’s soup (and no one has replicated it since!) He also made wine in his basement, an operation large enough that government officials check on him regularly. I will never forget their house with the trap door between the kitchen and the basement. I guess that was to aid in the wine making. We crawled through that door many times. Every visit ended with sitting on Grandpa’s lap to say goodbye. He would treat you with coins from his pocket. If you were lucky there was a 50 cent piece in the mix. I knew my Grandma much better as she died when I was 20. I wouldn’t say we were close, but we had an amiable relationship. I see her as somewhat of a mystery now. I knew her as a stoic, quiet person who rarely smiled. Through my research I’ve learned that she could hold her own in an argument and she did not let her husband color her politic views. They were rarely registered in the same political party. 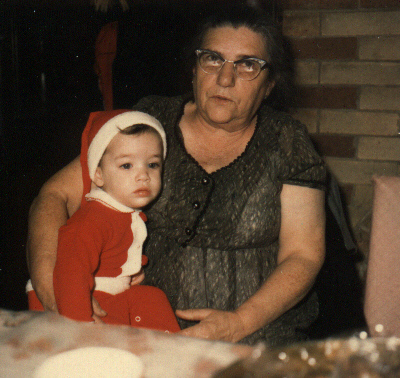 This is me with my Grandma around 1965. She was very talented with her hands. I remember the tatted doilies and embroidered dresser scarves that lined her house. She sewed pajamas for all the grand kids at Christmas (and lost at least one set every Christmas Eve). She sewed doll clothes and took my dolls every now and then to detangle their hair. I believe she was a very patient person. She was very kind and very quiet. I never heard my grandma speak ill about anyone. I will always think fondly of my Grandma and Grandpa Lassalle. This is how I will always remember them. It is difficult to be brief with grandparents isn’t it? Lovely photos. Thank you for sharing.